It looks to be a great weekend for going to the beach here on the East Coast. I’m actually planning to zip up to a friend’s house on the lake and read, swim and generally have fun by not working. I always like to do a thorough check of the galleys that await before I go away. I noticed an envelope on my desk that was soft and inviting. There is always something exciting about the seasonal promo mailings. What does the publisher think we’ll use or need? Will it be helpful? These are clearly subjective issues, as everyone has different tastes, but I think it’s easy to agree that we could all use a beach towel or two, and maybe a beach bag to tote around our books. 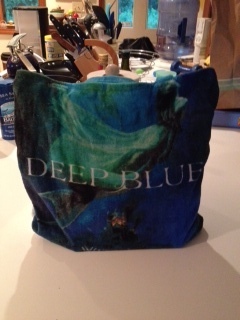 What I didn’t expect, and honestly, have never seen before was a towel that is also a beach bag. 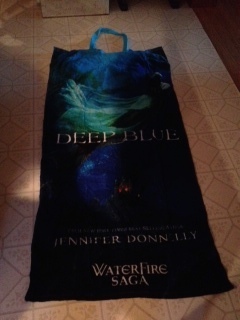 Call me simple, but I marveled at this delivery from Hyperion for Jennifer Donnelly’s new book, Deep Blue. The envelope sat on my desk, from yesterday’s mail, I opened it and at first I thought it was a nifty beach bag, but then Sandy suggested that it did something. A bag that does something? I opened it up and it turned into a towel, and back again. Okay, this is clearly simple fun, but still, I was delighted. And it holds a lot. 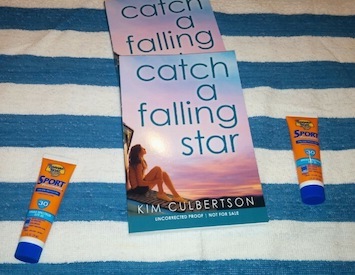 Then seemingly in a parade of beach things, we got a delivery from Scholastic suggesting that I needed to lounge by the water. Their package came with many things. A beach towel, sunscreen (how did they know I was out? ), a water bottle ,and a bag. Okay, that is a full set of fun things needed to not only enjoy the summer, but to enjoy it safely. All the necessary items are included, down to a book. Sure, I might complain about reduced co-op funds being available, but getting promo items that are not only useful but fun is always a lovely thing. All these beach-going items are making me consider what books to bring to the lake this weekend. In addition To Catch a Falling Star, I’ll be bringing some adult novels with me: the new Sarah Waters galley, The Paying Guests, and also the new Chris Bohjalian, Close Your Eyes, Hold Hands. What will you be reading while you, hopefully, lounge by the water? This entry was posted in Uncategorized on July 18, 2014 by Josie Leavitt. Enjoy your time away! I am bogged down with galleys and a pile of books from a library I rarely visit…who knows which book I will pick up next! I just finished The Enchanted by Rene Denfeld. Delightfully different read! hey, what about Barbara O’Connors THE SMALL ADVENTURES OF POPEYE AND ELVIS or ON THE ROAD TO MR. MINEO’S , or Brenda Woods SAINT LOUIS ARMSTRONG BEACH. All terrific summer reads, for both boys and girls.